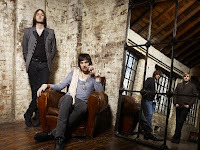 English rock band Kasabian will release their latest album, West Ryder Pauper Lunatic Asylum, on June 8. Kasabian, for me, falls into the same category as Oasis does. I like some of their songs but I don't really consider myself a fan. After hearing some tracks from the upcoming record, I'm digging what I hear. As a result, it very likely will end up in my collection. It makes me wonder, if I like it, what will actual Kasabian fans think of it? If you know me and you're a fan, tell me what you think of it the next time you see me! Check out the video of "Fire" from the upcoming West Ryder Pauper Lunatic Asylum.